Regulars here would know that Maruti Suzuki India Ltd, the company’s largest selling car manufacturer, will be out in full force at the fast-approaching Auto Expo 2018. Among the many new cars by Maruti Suzuki at Auto Expo 2018 will be a rather interesting concept that previews a future electric four-wheel drive vehicle. Dubbed as the Maruti e-Survivor, the electric convertible off-roader boasts many retro design elements and a lightweight construction. The e-Survivor is a design study model for a compact SUV that pays tribute to Suzuki’s 4WD heritage. At Auto Expo 2018, it symbolizes Maruti Suzuki’s commitment to help develop Electric Vehicles in India including local manufacture of components, charging infrastructure and recycling of batteries. 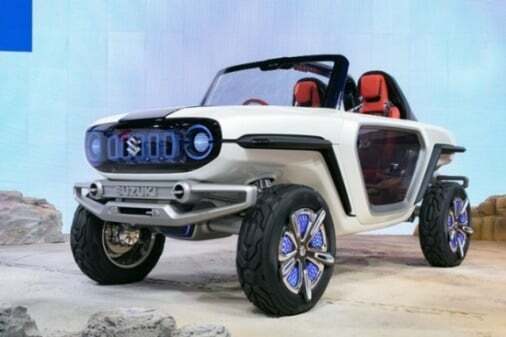 The new Maruti e-Survivor concept aims to offer an amalgam of the green electric technology and the fun of off-roading. Positioned as a futuristic concept, Concept e-SURVIVOR brings together many new technologies that depict the new and exciting F.A.C.E of Suzuki’s intent for Future Mobility. (Four-Wheel Drive, Autonomous, Connected & Electric). Details on the technical specifications are largely unknown at the moment. What we know so far is that the Maruti e-Survivor is a zero emission vehicle that is propelled by a set of electric motors. The concept offers a four-wheel drive setup. Basically, the concept has a ladder-on-frame construction and is powered by electric motors that are mounted on all four wheels. This system enables the car to have a four-wheel drive offering an electric four-wheel drive. The front façade is characterized by a five slot grille, round headlamps, and LED fixtures. The concept offers a two-seater layout and the interior has an orange theme.The dashboard is characterized by large touchscreens for infotainment and navigation controls. There are rear view mirrors have been replaced with displays connected to a rear camera. The Maruti e-Survivor gets see-through doors and vestigial wheel arches. The interior also gets a flat-bottom steering wheel, two screens built into the seats and even aircon ducts and speakers mounted within the seats. While nothing is confirmed at the moment, the Maruti e-Survivor might go on to donate design cues to the new model Gypsy. Maruti has been reportedly busy with the development of the next-generation Gypsy and the e-Survivor could be a sort of a pre-cursor to the upcoming model. Stay tuned for latest news updates on the Maruti e-Survivor concept.